Montgomery C. Meigs played a critical role in building a number of well-known landmarks in D.C. To ensure his credit would be preserved in history, Meigs was notorious for seizing opportunities to get his name inscribed on any items related to these monumental projects that he could. 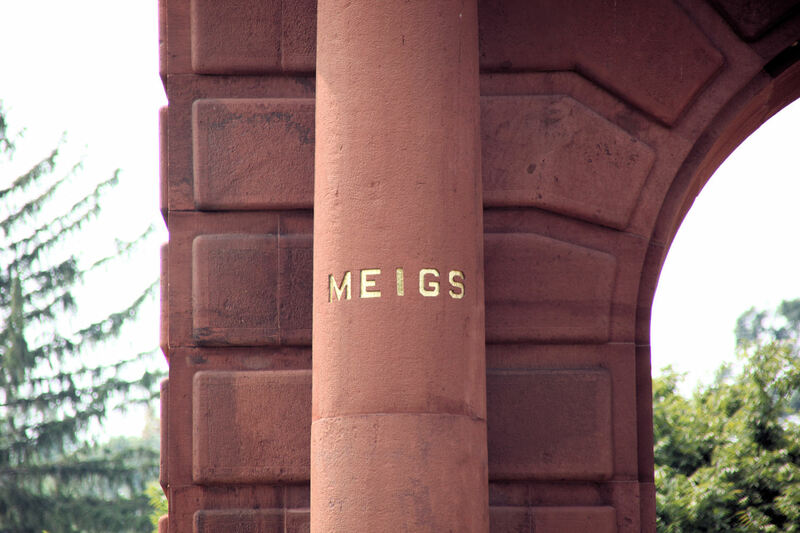 Meigs' name on McClellan Gate. Previously documented instances of Meigs' name include stone tablets at Union Arch Bridge across Cabin John Creek, vault stair risers at the Washington Aqueduct and McClellan Gate at Arlington National Cemetery. 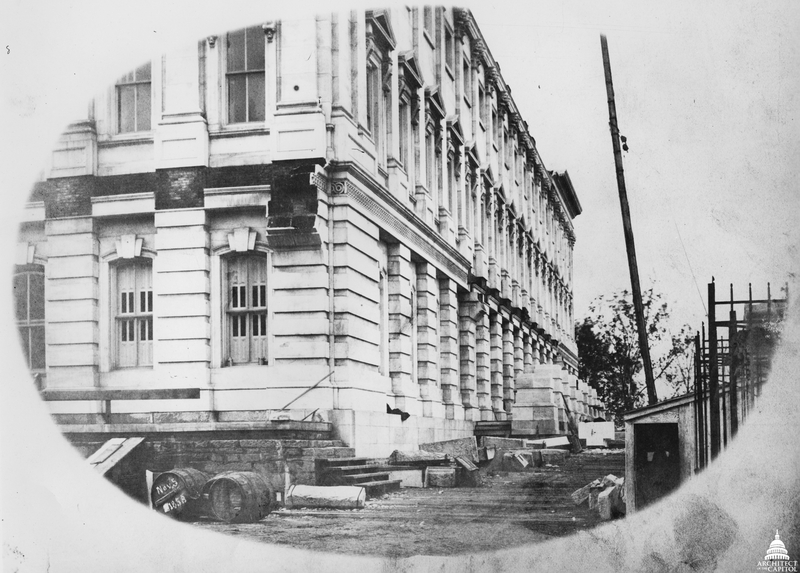 Northeast corner of the Senate wing showing progress on the east portico, 1858. Meigs also sought to leave a lasting impression on his work at the U.S. Capitol. Bill Allen's History of the United States Capitol describes Meigs arriving at the Senate's east portico "with a stack of [inscribed] copper plates… [slipping] one… under a marble block just as workmen lowered it into place." Inscription on the east portico plates. His hope was that the engraving would be legible for centuries and, if the Capitol were to ever become an archeological site, those who came across the plates would know exactly who built that area. While these plates remain hidden, another permanent signature from Meigs was discovered during the current Dome Restoration. Meigs' name visible on tie rod nuts in the Dome's boilerplate plenum. 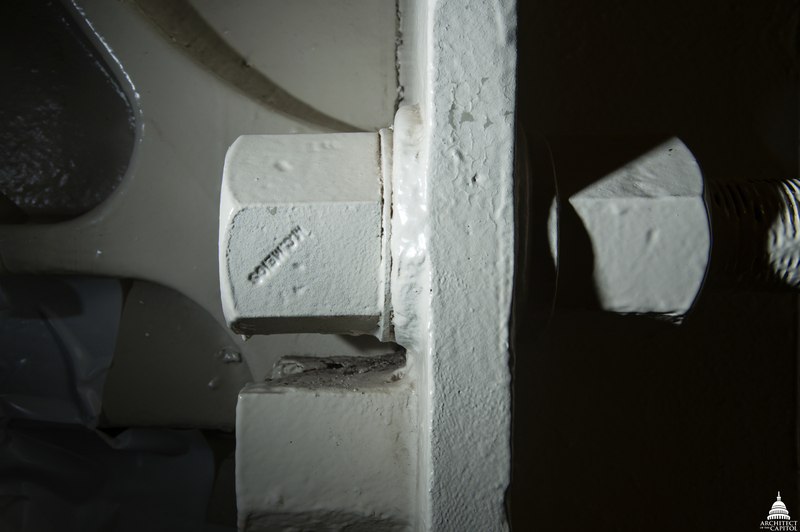 In an area of the Capitol's Dome that has not been restored since its original construction, Tom Nowell, inspector for the Architect of the Capitol, observed that the words "MC MEIGS" and "DOME" were stamped on the structural hardware. We may never be able to confirm whether or not Meigs left his name on additional areas of the Capitol, but this recent find is a fascinating piece of Capitol history and Meigs' moniker tradition. What is the function of the U.S. Capitol?